Monica Kar revisits the classic musical Barsat Ki Raat 1960, exploring the evergreen memorable songs and scenes of this delightful romantic story. While Part 1 dealt with the romance that began on a rainy night, Part 2 explores the multi-hued nuances of the three stunning qawwalis in the film, easily among the best musical duels the world of Hindi film music has ever seen. With inputs from Peeyush Sharma (in maroon font). 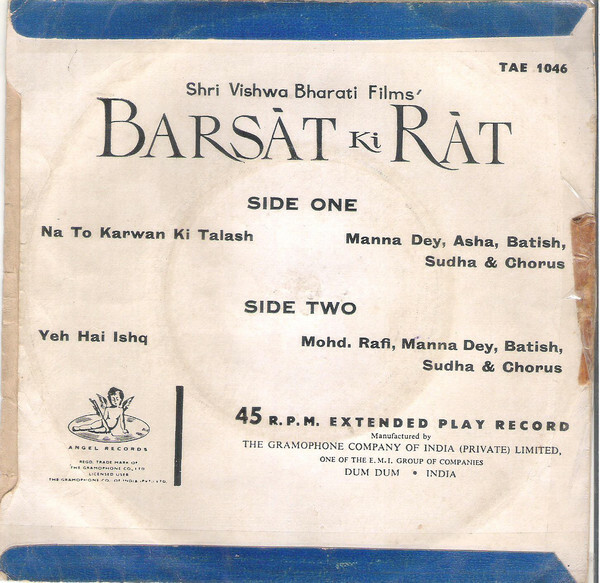 Barsat Ki Raat (Vinyl, 7″, 45 RPM, EP) that had the qawwali in 2 parts on each side. Angel Records Label ‎– released by The Gramophone Company Of India Ltd.
Barsat ki Raat is actually two musicals in one. 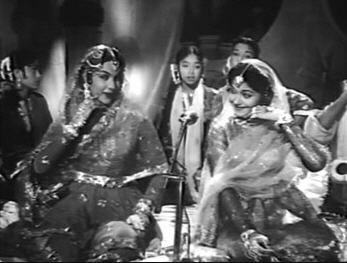 There’s the clichéd story of romance between Bharat Bhushan and Madhubala sprinkled with a superlative musical score and then there is the story of the qawwali competitions. With music touched by Divine Dust. 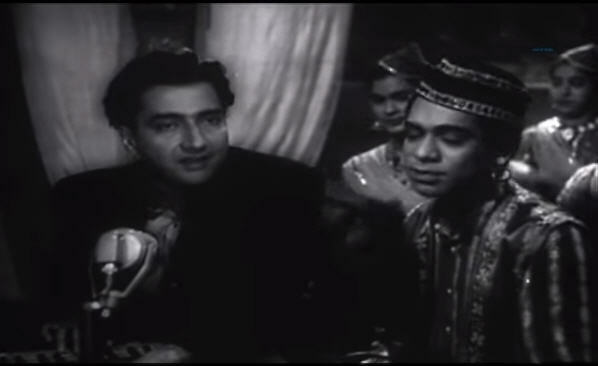 The elements common to both stories are Bharat Bhushan, Rafi, Sahir and Roshan. And, of course the thread of the storyline that continues to be linear, and continues to delight the editor in me, as already stated in my earlier essay, Barsat ki Raat Part 1: A Musical Romance. Let’s take a look at the second part of this unforgettable musical. Amaan Hyderabadi (Bharat Bhushan) and Shabnam’s (Madhubala) romance seems to have lost out to parental disapproval. The hissing of that hot iron doused in water, at the end of Maayus to hun vaade se tere seems to signal a sort of finale to the “aas” of these lovers ever meeting again. For various individual purposes – all of which are elucidated, not left to imagination – the action in the movie shifts to Lucknow, for all the key players. Madhubala is taken there by her parents to get married to one Aftab Ahmad. 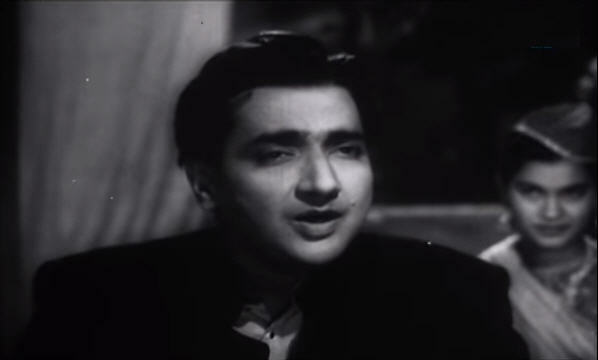 Bharat Bhushan is trying to escape or find peace for his broken heart. He, incidentally, is going to his friend’s house in Lucknow, who happens to be the same Aftab Ahmad that Madhubala will be wed to. 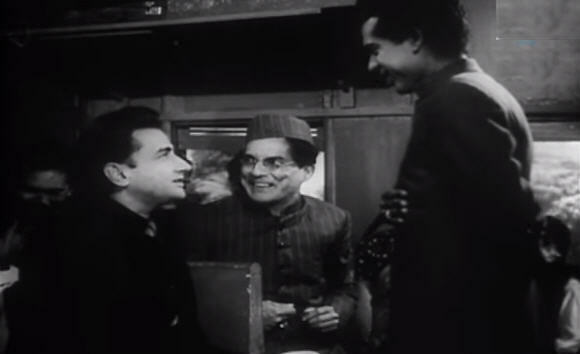 On the way, however, in the train, the second half of this movie picks up speed when Bharat Bhushan meets Fitna Faturabadi, a ‘fake’ poet, and Chand Khan, the qawwal, who are going to Lucknow to participate in a qawwali competition. He lands up, by a twist in the tale, with the two at their home, writing the poetry they need for their competition. At the competition their opponents are presented – Mubaraq Ali and his daughters, Shama (Shyama) and Shabab (Ratna Bhushan) from Gulbarga, Bharat Bhushan’s old friends. Backed by Amaan’s poetry, Chand Khan wins this competition. But since the ladies have established themselves as worthy contenders, the promoters of the competition decide to have a second round between the two. This one is won by the ladies, supported by Amaan, who walks into the arena where the competition is held and recognizes his old benefactor, Mubaraq Ali and his daughters, whom he then helps by supplying them the poetry they need to win. The screenplay is finely detailed, as I said before. Even at this late point in the story, a small, impish love story between Chand Khan and Shabab is brought to fruition very skillfully and neatly without it taking away from the main story in any way; yet, being given its due. The result of this union is that Chand Khan joins Mubaraq Ali’s group, in readiness for the last, the grand competition to be held in Ajmer against a much bigger opponent, Daulat Khan. Qawwalis are, as you know, Sufi offerings at dargahs and shrines. The genre was popularized by Amir Khusro in the late 13th century, with the first qawwalis being offered at the shrine of his guru, Hazrat Nizamuddin Auliya. The theme central to the qawwali seems to be love of, devotion toward, and longing for, the Divine. 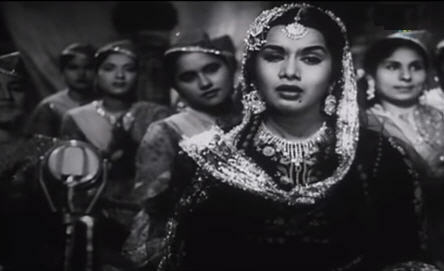 Exactly when Hindi films took this genre and creatively adapted it to romantic situations, I do not know; though there is the very popular Aahein na bhari, shikwe na kiya, kuchh bhi na zubaan se kaam liya, an all-female qawwali from Zeenat in 1945, sung by Kalyani, Zohrabai Ambalewali and Noor Jehan, penned by Nakshab Jaarchavi and put to music by Mir Sahib. In many instances the qawwali has been presented by our films as a musical debate, with two sides presenting the pros and cons of a single ‘topic’. Not only do these forms of ‘poetry’ allow for improvisation, they create a bond because they are essentially group experiences. The power in them attracts me – the sheer energy created by many people singing and repeating, the clapping, the beat and rhythms, the back-and-forth in the qawwali that Hindi films provided, the sense of competition in music, the sounds of the qawwali, especially the harmonium. It might be pertinent to note here that qawwalis are generally sit-down affairs and must rely on hand gestures, facial expressions and clearly enunciated lyrics to make their impact. To this end, the qawwals must have expressive voices and faces in order to achieve their goal of involving the audience in this group experience. In my limited understanding, by and large qawwalis are not ‘written’, they are ‘composed’. What this means is that this is not a genre of poetry; rather, a genre of music. And it really is up to the composer to perhaps create a qawwali out of a piece of written poetry. Manek Premchand, the eminent musicologist, clearly defines the pre-requisites of this genre in his engaging essay, RIP Qawwali? Having said that, here is a quote from this movie that offers another perspective ye zaroori nahi ke har bada shaayar qawwali likhne ka tajurba rakhta ho, implying that writing poetry for a qawwali is different from writing poetry for, say, a nazm. Let’s revisit this point in a little bit. To get back to the team of Roshan and Sahir that created the qawwalis for Barsat ki Raat. 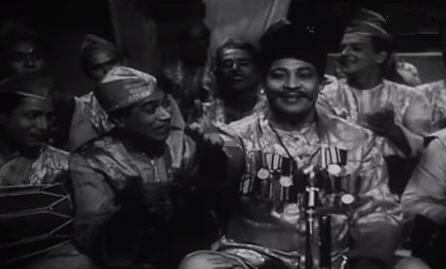 Sahir and Roshan first made a qawwali together in Babar, 1960, released 5 months prior to Barsat Ki Raat – recall Haseenon ke jalwe pareshaan rehte, agar hum na hote. It was a reasonable hit. Then they had Barsat Ki Raat and next they made qawwalis in Taj Mahal, 1963, remember Chandi ka badan, sone ki nazar, uss par ye nazaakat kya kahiye, eji, kya kahiye? Taj Mahal was a box-office success, with all the songs being hits. The film got Roshan the Filmfare award for best music. 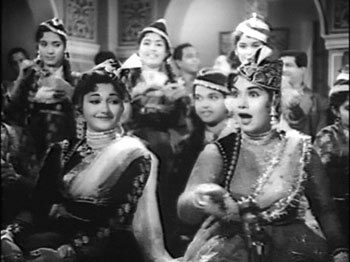 The next one by Asha and chorus in yet another PL Santoshi film, Dil Hi To Hai (1963) was arguably as big a hit as Barsat ki Raat, Nigahein milaane ko jee chaahta hai. Bahu Begum, 1967, had 2 qawwalis, designed to complement each other, exceptionally beautiful ones, Waqif hoon khoob ishq ke arz-e-bayan se main, keh doonga dil ki baat, nazar ki zuban se main. And the next even more lovely one, Ab jaan-balab hun shiddat-e- dard-e-nihan se main, aise mein tujhko dhoond ke laaun kahan se main. 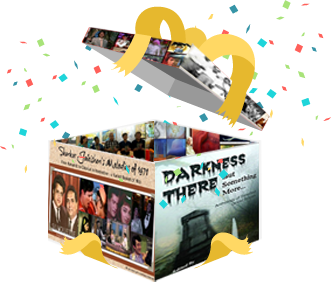 The point is Barsat Ki Raat was not an exception and the team of Sahir-Roshan repeated the feat a number of times. In Barsat ki Raat, Roshan – also known as the King of Qawwalis – composed three extremely interesting compositions, an unbeaten feat, to my knowledge. The logic and linearity of the movie is not abandoned here. The linear progression that marks the screenplay of this movie seems to have touched its music as well. Roshan builds the excitement, as it should be built in a competition, from the first qawwali, with each building upon the last in terms of not only the music arrangement, but the costumes on stage, the poetry and the singing too. 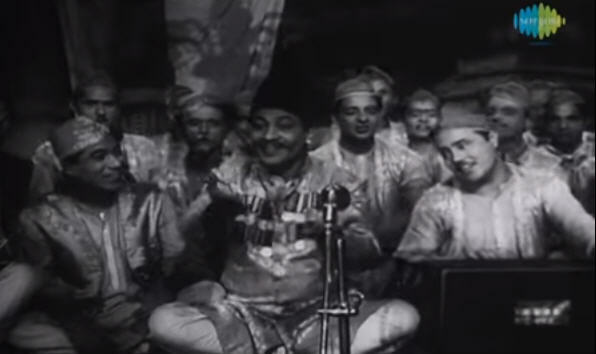 The first qawwali, an 8 minute 42 second presentation, starts off with an almost 50-second musical prelude. The harmonium, clapping, dholak, a ghungroo-like sound that could very well be a khartaal – the usual suspects – are employed here before the ladies start off the competition a Cappella. One cannot but admit the harmonium as a singer by itself here, so distinct is it in making its presence felt! Asha Bhosle’s impressive alaap starts off the vocal part of the qawwali as she and Sudha Malhotra throw down the challenge in an open field, inviting a response to their question Na bach sakein to bechaaron ka haal kya hoga? Roshan brings in Shambhu Qawwal, the younger, more nasal sounding brother of the Shankar-Shambhu Qawwal fame to be the voice of the male side of this competition. What a marvelous touch! His voice is the perfect foil to the ladies’ as he effortlessly rebuffs every stingray the ladies launch. Questions are answered by questions, until there is no comeback left and the ladies lose this round. A few things are important to note here. While the harmonium, the clapping, the sound of that ghungroo and the dholak remain the same, Roshan adds a bulbul tarang here to the mix. 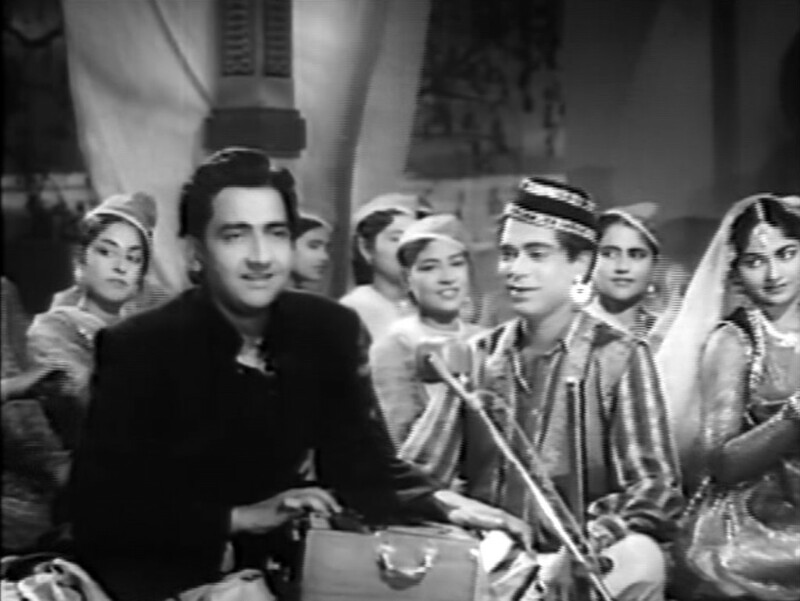 Not only that, as soon as Bharat Bhushan enters the scene, there is a sweet flute that joins the mix briefly, creating a far more musically rich background to this second qawwali than the first had been. The linear progression in terms of musical quality visible here. Almost an hour and 45 minutes into the movie, when this qawwali starts, the first unexplained detail appears. How and why does Bharat Bhushan decide to attend the competition? He’s a blessing for the ladies, obviously. And the competition gets underway. These short forays or side-trips from the mukhda and/or the antara, and repetition of the same, either completely or parts thereof, are what distinguish a qawwali framework. The lyrics, therefore, must have this flexibility in-built in them. Of course, it is up to the composer to enhance the complete structure as he deems fit. Roshan obviously had mastered this craft. One wonders how he learned the intricacies of arranging the lyrics of a qawwali in the way in which these two have been arranged, as it seems, with a Master’s stroke! The interest of the listener does not lag for an instant! Both these qawwalis come back to a slow last line, having experimented with different beats in the duration of the qawwalis. 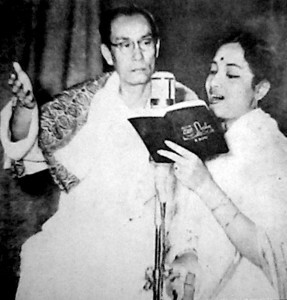 And while the success of the first two qawwalis is really the result of Roshan’s masterly arrangement and use of instrumentation, with his use of perfectly pitched vocals, helped more than capably by Sahir’s writing, it is really difficult to pin-point any one star in this third qawwali. It has been called the ‘mother-of-all-qawwalis’ and on one site, even the ‘grandmother’ of all qawwalis in Hindi films. Correctly, too. Let’s take a look at this formidable creation. A 55-second prelude that is the most musically-rich among the three qawwalis. There is the harmonium, the dholak and the clapping , but here, Roshan teams them up with the saarangi, the sheesha and even some sitar! 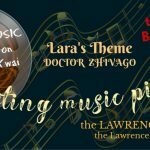 Not only that, there are two rhythms in the prelude itself, the richness in music, a precursor to the richness in thought and poetry, about to unfold! This time we see Chand Khan sitting with the ladies, as they are now one team. Their opponent, one presumes, is Daulat Khan, because herein enters the other unexplained detail, one that, perhaps, was sacrificed at the editor’s table, as this 12+ minute qawwali is never properly introduced in the movie. A little detail to remember here is that this qawwali was recorded as two separate qawwalis, but in the movie forms one long progressive thought, tying up all the various threads of the movie’s storyline as well as completing the debate started in the first qawwali. What Sahir starts out with is the eternal beauty Vs. love debate in the first qawwali. In the second qawwali he starts off by addressing that same husn and acknowledging the power of the ‘glance’. Because isn’t that where love enters the picture? The glance that is the literal, physical, glance meeting another and sparking off a connection that turns life upside down. But this qawwali, at the very start, announces that this is not going to waste its energy on any debates. While the first qawwali is a collection of questions, and the second is a collection of declarations, this one is a want, a desire, a search, and a quest – teri rehguzar ki talaash hai – a path that leads to you. Here comes a case of transferred emotions. Manna Dey responds to this search for a healer (chaaragar) whose medicine is the granting of cessation of life itself. And his response, a definition of what ishq is – more than just beauty, or just a glance – breaks Shama down and she is no longer able to participate in the qawwali. Henceforth, it is the sprightly Shabab (Sudha Malhotra) who carries the qawwali forward from the ladies’ side. Sahir here has already started the qawwali towards the sublime. Ishq, he says, is desire, honor, heart-body-life, and Faith. What’s left? This is exactly what happens here. 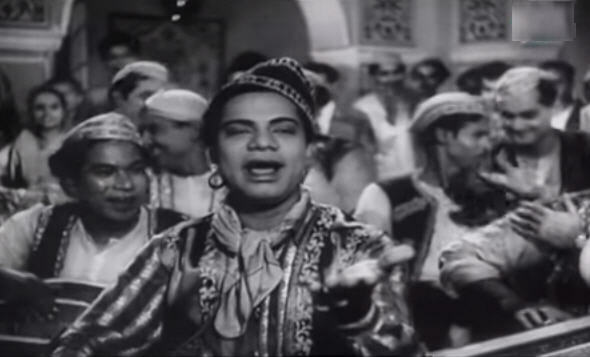 The audience is delighted at Manna Dey and party’s repetition of ishq, ishq, ishq, ishq, and this, then becomes the new asthayi, or mukhda of this qawwali, changing the thought from Na to kaarwan ki talaash hai to Ye ishq ishq hai, ishq ishq. Extremely cleverly Sahir has led his audience from the quest of the path- rehguzar – that leads to “you”, to define that “you” as ishq. The quest has become ishq, which is, in his own words, imaan ki jo poochho to imaan ishq hai. A play on words here, like Chand was used in the first qawwali, Sahir uses Shama here to point out the ones suffering in love. This crumbles the little resolve that Shyama has, and alerts her group that she is unable to participate. 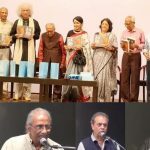 The last rejoinder to this ‘shama’ taunt by Manna Dey is a reminder in Sudha Malhotra’s voice that it really doesn’t matter who you are in this mehfil (world) – a flame, Shama, that burns without a choice or a moth, parwana, that invites destruction by venturing into dangerous ground. The end for each one is Death. I must have heard the last qawwali, Na to kaarwan ki talash hai, in its’ full form at least a thousand times if not more. It delights each time. What stands out is that it turns sufi in the second part. Qawwalis are supposed to be sufi. But the moment Rafi enters with his alaap the whole effect changes. 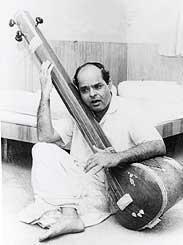 That alaap and the way Rafi delivers it is just outstanding, unparalleled. It wets my eyes each time. Then for sure Rafi carries it on his vocal shoulder all through. Like Peeyush Sharma says, when Rafi enters with his alaap, he creates a deep silence. A silence that holds within it the secrets of the ultimate truth. The ultimate truth that leads to an ultimate dissolution. Of the physical with the sublime, man with God, until there is no difference. This ultimate truth, Sahir says, is ishq. But not ishq in the casual, romantic way it is understood. Remember, earlier Sahir has said ishq is imaan. Here, very quietly, very gently, he introduces the notion that love is greater than imaan, where imaan is Faith or Religion. A thought that he expands on, making ishq a religion of its own. That Sahir leads us by the finger, one step at a time, to elevate the status of ishq from mere romantic love to an all-engulfing phenomenon is clear. It is also clear that in this one-sided debate, he uses the most extreme and divine examples to rest his case – from Laila-Majnu to Radha, Janak-dulari Sita and Meera, all strong women who flouted society, its rules and dharams to create their own. 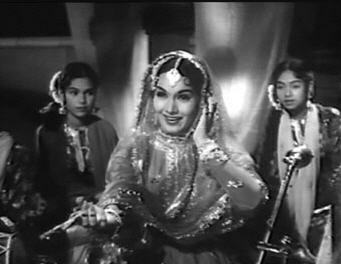 And, as Bharat Bhushan cites these examples on screen, he gives Madhubala the strength to find the Radha, Meera and Sita within herself. The Laila to her Majnu. But what is as delightful are the words he uses to connect these steps. From a katthin dagar where it may be difficult to bhar laaun Jamuna se matki; with this reference triggering a mention of Krishna and Radha. So adeptly done in the context and format of a qawwali! What stands out in Sahir’s qawwali lyrics here is that he, in poetic perfection borrows not only from Urdu but equally from Hindi and Avadhi. He talks about Allah, Rasool, Quran and Hadees and with equal fervor from Jab jab Krishna ki bansi baaji, Meera and Radha, Gautam and Maseeh. This could only happen in Indian film music. This is our heritage history that I am so proud of. More examples follow. And you realize that Sahir really is not an atheist. He is a Believer. But his belief is not limited to any one religion of this world. In many ways, this qawwali is itself a path, maybe a ladder, leading from one level of elevation to another, until it reaches the peak of sublime thinking. Maybe a man’s journey from the physical to the soul. From a human longing for love to a Sufi longing for the Divine? No, Sahir takes it one step further! At the very pinnacle of this climb from base camp to the Everest of thought, comes this delightful argument. Do note that by this time he has no one challenging his belief. This is no longer a qawwali. It has gone beyond a mere competition. The hands of the sculptor lovingly turn clay into idols. The idols, lovingly worshipped, become God. If you think about the sculptor here being God, the last line becomes completely clear. For, God creates man with love. The love that man feels for God can, in turn, create him into God. We’ve come full circle. From Him to him, back to Him. Our vehicle? Pure, unadulterated love. Ishq! Inteha ye hai ke bande ko Khuda karta hai ishq. Once you’ve converted the limited into the Limitless, the bounded into the Boundless, the miniature into the Cosmic, you’ve encompassed everything and nothing remains untouched. Nothing really remains to be touched, or said, then. Quite unlike the format of a Qawwali, this one ends on a high note, with no going back to the mukhda – we’ve come many thought processes and belief systems away from mukhdas and antaras here. Do note that the director makes sure the audience knows this last qawwali is being held in Ajmer. Ajmer, home to the dargah of Persian preacher, ascetic, religious scholar, philosopher and mystic, Moinuddin Chisti. 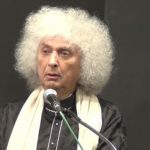 If Wikipedia is to be believed, Chisti was “one of the first major mystics to formally allow his followers to incorporate the use of music in their devotions, liturgies, and hymns to God”. Just one more detail in the long list of details the makers of this movie got right! There is a richness that the poetry and music of this movie bring to the soul. A deep reservoir of the purest, most sublime ishq. An ishq for music, for poetry, for singing, that one can dip into each time the dryness of the real world takes over. This reservoir remains full, no matter how many times you dip into its comfort. This is one Barsat ki Raat that I don’t mind being drenched in! Premchand, Manek. (2017, October 29). R.I.P. Qawwali. Qureshi, Regula B. (1986). Sufi Music of India and Pakistan: Sound, Context and Meaning in Qawwali. Manek, this comment will egg that caravan on, for sure! I learn how to curate music from your vast work each day and each day I’m amazed at how much your ishq with the music of Hindi films can teach the rest of us. Deep respect for your work. Your inspiration. Many many heartfelt thanks for leading the way, and for this awesome comment! You’ve made my day! Profound, exhaustive essay. The author has contemplated deep, especially on the final qawwali, for a nuanced deconsturction, which must have been a very difficult task, for it would not have been the question of her understanding of the qawwali but one of reaching out the readers with clarity with deeper layers – the quasi abstract layers – unraveled. 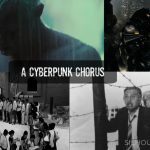 I can without any exaggeration say that Monica Kar has, with this essay, established herself as a writer who can vie with the very best in the domain. And Peeyush ji’s short interjections are so informative, almost in the nature of strengthening links. To my mind, this qawwalli was an opportunity for Sahir to bring about an inalienable fusion of the lover and the rebel within him. Look at the women he chose in the concluding part : all rebellious lovers – the feminist in him also coming to the fore. And I feel that this qawwali is not normative as it does not in real sense pit one side against the other. They seem supplementing each other with no real loser. No punches are exchanged, no repartees. Nor has it any carnal trappings. Its start is sublime and that ascends to a point where Sahir so subtly rather obliquely refers to the form and essence dichotomy … kaayanaat jism hai aur jaan ishq hai…. body is maya-material and the soul – jaan – within is love sans mundane trappings. Vijay Kumar ji, I am completely, totally, humbled. 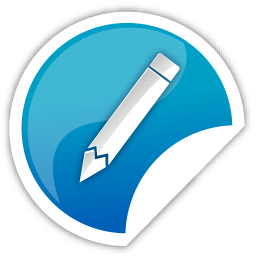 Your comment is a huge honor for the writer in me. Your comment also brings home to me the fact that I have miles – or maybe lifetimes – to go before I catch up in thinking with you :). Deep, sincere thanks. Deep, sincere respect for the thinker in you. The Knower. Wow what a write up, Roshan Saheb should have won award for this movie. He put all his musical experience in this movie with all superhit nos. Roshan Saheb has done an excellent work. No other movie Qawwalis gained such popularity as Barsat ki Raat Qawwalis did. Hats off to him & Sahir Saheb. Fitting title Grandmother of all Qawwalis. Thank you for sharing. Taiyeb Shaikh saahab, I agree with what you said about Roshan’s feat in this movie – what a range he exhibits! Right from “Garjat, barsat, saawan…” to “zindagi bhar nahi bhoolegi…” to this grandmother of all qawwalis – it is interesting that even he couldn’t surpass what he had created in this film! Sincere thanks that you liked this write-up. That makes it all worthwhile! Thank you, also, for your wonderful comment! Thanks Maam, You made my day with this super-essay! Hehehe… and you, sir, have quite made my day with your lovely comment! It’s very rewarding to write about one’s passion and find people who not only respect that passion, but encourage it like you have. S.V.Nathan, deep and sincere thanks! If you enjoyed reading this, maybe you will enjoy the 1st part too?